← The Amazing Columbia River Gorge! 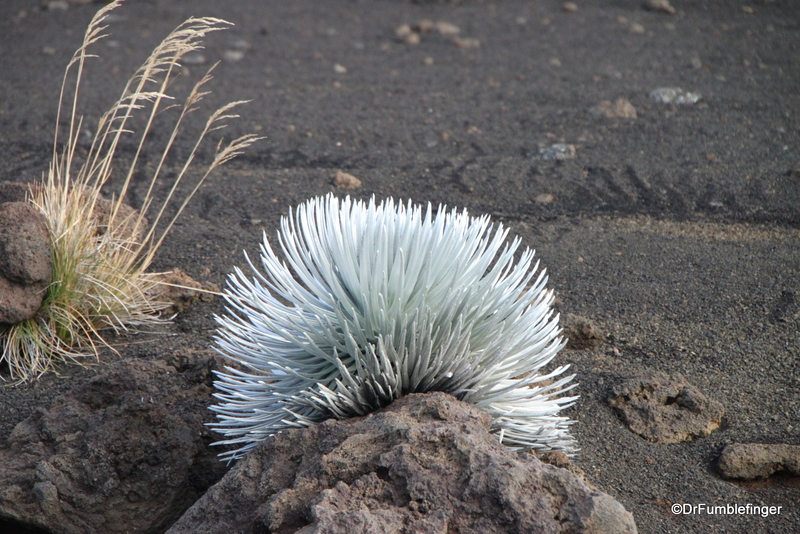 Among the pleasures of being atop Hawaii’s giant volcanoes — Haleakala on Maui, and Mauna Kea and Mauna Loa on the Big Island — are the unusual things you see. Standing on an otherworldly landscape of reddish-brown or gray-black lava rock, the views over the clouds are often breath-taking. You can often see the Big Island from the top of Haleakala, and Maui from Mauna Kea. 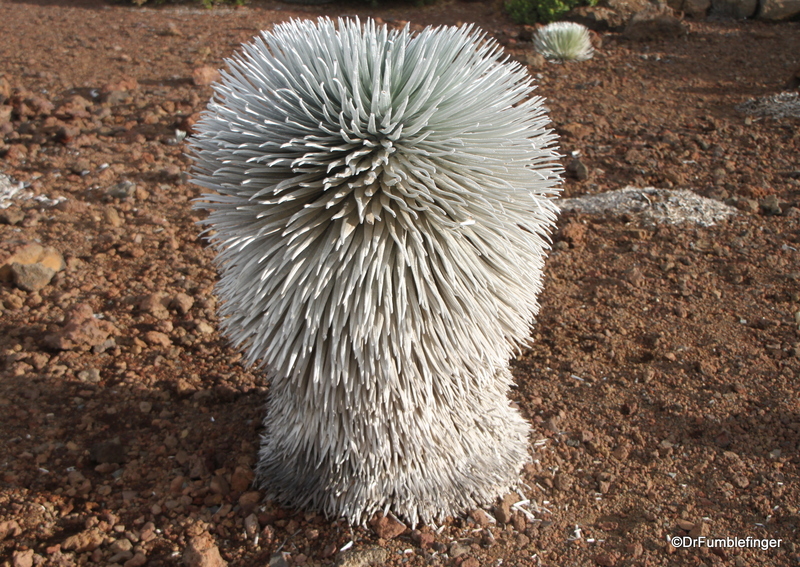 If you divert your eyes from the magnificent views to the ground, you’re likely to see this rare gray-silver spikey plant known as “Hawaiian Silversword”. 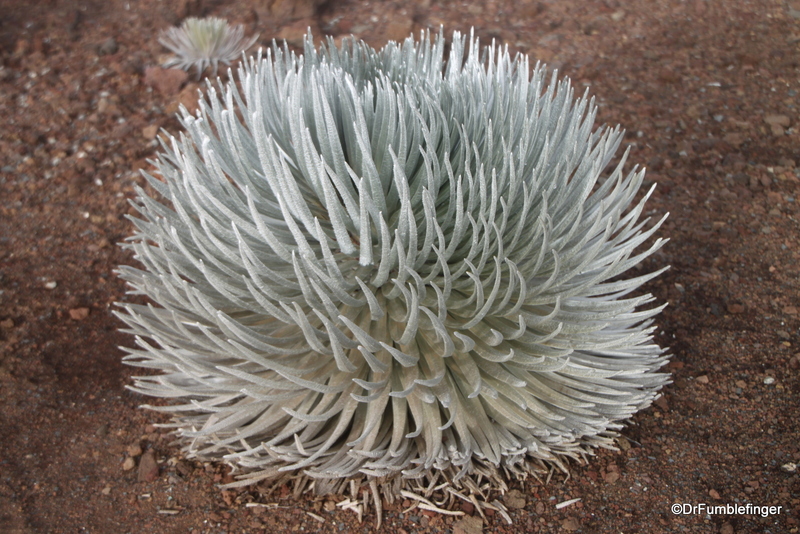 It only grows in Hawaii and then only a mile or more above sea level. Your best chances of seeing it are on the giant volcanoes. The climate up here is harsh — hot and cold, and very dry, with little soil, but the plant is hardy enough to endure this environment. The plant is endangered largely because people like it so much they tear it from the ground to take with them as a souvenir. It’s making a recovery but is still uncommon. It lives from 3 – 90 years and at the end of its life sends up a tall shoot (which can be as tall as a man) which blooms before it dies. These blooms become seeds which spread in the wind and propagate the plant. Seeing one in bloom is a matter of good timing luck, as they only bloom a few months of the year!